(SPOILERS) Edgar Wright’s recently revised, gargantuan list of favourite movies (a more interesting and economical rundown might have detailed what didn’t make it on) included many I haven’t seen, and a good few I thought “Oh, I must revisit that”. Of the latter, one such was Michael Crichton’s uneven science fiction thriller Looker, which typically for the author includes prophetic warnings of technology allowed to rampage unchecked. It’s also loaded with satirical swipes at the beauty myth, TV addiction and our capacity to be influenced by advertising. The movie arrived at the perfect moment, predicting a decade that would wear shallowness as a badge of pride, yet floundered in execution, perhaps because as a director, Crichton is a better writer, and as a writer of screenplays, he’s a better novelist. It might have been preferable for someone with more of a stylistic bent to take this material and run with it. What Verhoeven (then still in Holland, obviously) might have made of the satirical content is tantalising, and likewise how De Palma might run with the opportunities for sleights of perspective and orientation. Crichton’s direction is competent, functional and unadorned, so never in danger of taking your breath away. He composes several strong sequences, however, most notably the visualising of the 3D imaging in which Susan Dey’s model Cindy has her body print measured; the projected patterns overlaying her simultaneously suggest hi-tech and the right side of psychedelia. Crichton also has a ball with the L.O.O.K.E.R (Light Ocular-Oriented Kinetic Emotive Responses) gun, creating a disorienting and eerie “lost time” effect as its subjects are zapped and rendered varyingly incapacitated, unable to perceive their aggressor and coming back to awareness with vital changes having occurred in their surroundings. In the early stages, when the source of the disturbance is still a mystery, the jumps in clock times evoke alien abduction scenarios. Later, when Albert Finney’s Dr Roberts is set upon by Tim Rossovich’s moustachioed heavy (a sure sign of a change of decades that a facial caterpillar now signifies a bad guy), Crichton fashions an inspired action scene as the beleaguered plastic surgeon must attempt to turn the tables on an antagonist who has a perpetual advantage. Crichton even throws in a car chase with the device, leading to Roberts and auto reviving in a fountain, the villains departed (why Reynolds didn’t keep the pair of sunglasses he picked up in the lab is one of a number of glaring plot holes). Unfortunately, there simply isn’t enough substance elsewhere in the story for Crichton to sustain matters. He would later revisit the virtual world as a scene of a crime in the ill-advised sexual harassment thriller Disclosure. Here, the problem isn’t the conception, but simply that he has insufficient places to go with it. James Coburn’s John Reston is revealed to be behind everything, through his company Digital Matrix Inc, during his first encounter with Roberts, through an incredibly clunky “I’m the villain don’t you know” piece of exposition with his assistant Jennifer Long (Leigh Taylor-Young). The only mystery is how the device works and why Reston has been having the models who visited Digital Matrix bumped off. And an explanation for the latter never materialises. Well, it kind of does in one of the cut scenes that showed up on TV, but the explanation isn’t entirely satisfying. We’re introduced to Roberts (“Everybody says you’re the best plastic surgeon in Beverly Hills”) agreeing to perform surgery on the fourth in a succession of perfect beauties who show up at his clinic with a list of precise nips and tucks to be engineered. The dialogue is occasionally clumsily on-the-nose (“She’s a real looker”; “Has a big man with a moustache been here?”) and occasionally amusingly offhand (“I’ve got some tricky eyes at noon”). When the women start showing up dead, the doctor is quickly set up as a suspect (a button from his jacket is placed at the scene of a crime). When Roberts begins his own investigation, he is given a lesson in the skin deep nature of perfection, told that while the models looked perfect, as the computer at Digital Matrix dictated, they were still flawed on the inside, unable to reproduce the detailed instructions for how to render the scenes in advertising projects. The actual detail here rather breaks down; Roberts is shown an ad where he is distracted by the model instead of focusing on the product, but surely no amount of doctoring is going to alter that? The only real way would be to remove the model entirely, rather than shift focus. We learn that mapping the model will lead to them being paid $200k per year, to utilise their image rights, the virtual clones rendered over physical set and props. Again, some of this is rather baffling in concept; why not just map the car and have that reproduced to, rather than physically opening its boot and having the virtual model overlaid, appearing to do so herself? We discover that the models, not unlike the light gun, induce an “auto-hypnotic suggestive trance” to encourage viewers to buy the product (visualised in the blue-glowing eyes, although I’m guessing this is supposed to be a cue for the viewer rather than eyes actually glowing every time one starts on telly, a bit of a give-away if so, although there’s lots of this sort of obvious clumsiness, so maybe not). And the next stage is to repeat the process with that other prized field of populace manipulation, politics, with a virtual Senator Harrison (Michael Hawkins) encouraging voters in his presidential bid. One of the issues with Looker is that, amid all this hi-tech intrigue and high-conspiratorial play (it’s suggested the police may be in on things too, but that ultimately proves not to be the case), Reston and his cronies haven’t been terribly clever about framing Roberts. Everything they do seems designed to display staggering ineptitude and make as big a scene as possible. Perhaps the dedication to following computer logic has resulted in them making howlers. Or perhaps hubris leads them consider themselves untouchable. In the deleted scene, Reston explains that the murdered models were “walking examples of our computer research” and that it is “corporate policy to shred all old documents and keep it out of the hands of competitors” thus providing their motivation. But... if every time they map a model, to use in adverts, they kill the real one, it’s going to be a tad blatantly obvious who’s responsible. And even if this was a one-off, for test purposes (with the political side being the real objective), it’s still incredibly dubious and risky. Other theories have been voiced, that the girls found out about the political side (what, all of them, include Cindy, who hadn’t a clue, and how did they find out?) or that the company simply didn’t want to pay them (right). Crichton seems to be taking an almost casual approach to internal logic, assuming that, amid all the chasing and shooting, viewers will forget to ask the questions (very meta-, eh; we’ve been hypnotised by Crichton himself… except it didn’t work as no one was interested in watching the thing). As it is, one gets the sense the scene was excluded because it was so unconvincing, and Crichton, without anything better, hoped no one would notice (what in fact happened was that no one noticed the movie). Reston paints himself as a promoter of global order, as any corporate true believer would rationalise (“It’s the multinationals who want peace and stability throughout world while governments spin recklessly out of control”), and it’s to this end that he is steering Senator Hawkins’ campaign. The general gist of Hawkins’ spiel could have been written yesterday, with its appeals to American values, forefathers, and “ending the pollution of the environment and in our lives”. Of course, the idea that the public should even need hypnotising through such a method is really Crichton’s point; we’re doing a very good job of swallowing whatever we’re fed hook, line and sinker. Reston: Who would have predicted that free people would spend one fifth of their lives voluntarily sitting in front of a box with pictures? Fifteen years in prison is punishment. But fifteen years sitting in front of a television set is entertainment. Reston goes on to provide further specifics (“One and a half years of life with commercials, fifteen minutes every day of life”). Crichton’s polemic is a little reactionary, since one might equally claim spending one’s life with one’s head in books is a waste, when you should get out there and live it. He has a point, but like most of his points here he hasn’t distilled them to a sufficiently digestible concotion. For example, fake advertising runs throughout the picture, but rarely carries the sharpness of presentation that would make the barbs sting. Some of the background accompaniment raises a smile (“Constipation is nothing to be sneezed at”), and the TV-addicted parents of Cindy are very similar to Emilio Estevez’ telly evangelist-transfixed parents in the later Repo Man. The intercut finale, playing out as viewers see the real combatants interposing themselves into the virtual characters’ scenes is frequently quite funny – moustache man winds up dead on a kitchen table as kids complain to mum that they’re tired of the same old breakfast; the ad for Spurt toothpaste (“New Spurt makes any mouth come alive”) that plays out as a bloody squib erupts from Reston’s neck is a particularly mirthful touch – but never quite as effective as it could be (one only has to look at any earlier scene, in which Crichton labours an insert of Roberts stealing entry tags, to see where the picture is coming up short). 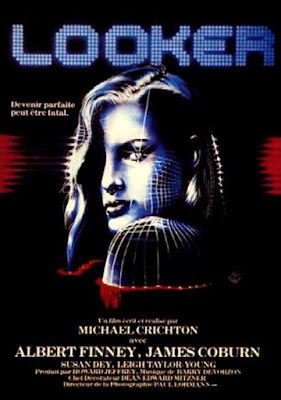 Paul Lohmann, a veteran of Robert Altman and Mel Brooks, photographs Looker nicely enough, and there are some nice design touches, such as the illuminated floor that would look at home in TRON, but Crichton’s approach fails to embrace the potential. His inclusion of title cards (Friday; Sunday) feels arbitrary, as if he saw it in a movie, liked it, but has no good reason for it narratively (it probably resulted from the temporal disorientation of the gun, but doesn’t play as a helpful guide). Barry Devorzon’s score is early ‘80s synth heaven without ever being especially distinctive; the most effective choice on the soundtrack is the use Vivaldi as Roberts works on a patient and then again accompanying Cindy’s topographic scan. That said, the cheesy songs (Looker and High Wire) are good fun. 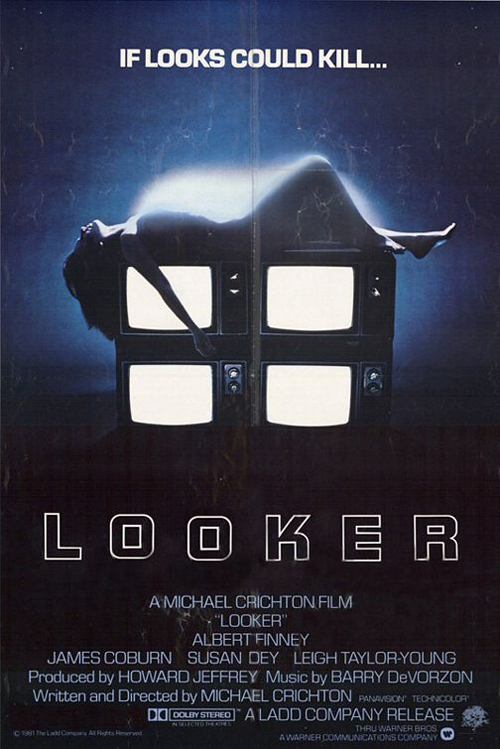 There’s a slight TV movie feel wafting through Looker, from the henchman to the second choice leads. Coburn is always a fine catch, but he isn’t used especially effectively here (indeed, his best scene might be the cut exposition, as dissatisfying as it is). Finney had spent four years away from the big screen, yet returned with a couple of movies where he filled shoes he had mostly steered clear of in his career; the classic hero type in this and Wolfen. You need to give Finney something actorly to get his teeth into to make the most of him, and Looker simply fails to do that. For all that, Looker’s not a bad film. It’s arresting premise sees it through a lean running time, and the sequences with the L.O.O.K.E.R. gun and the body mapping are particularly noteworthy. What it really lacks is the immediate, portentous quality of Crichton’s ‘70s thrillers (Coma, Westworld); a tangible sense of how these advances in technology can lead to the whole world unravelling. Perhaps plunging more assertively into the political side would have done the picture favours, but as it is, this element seems like little more than an afterthought. It’s ironic that a movie taking pot shots at the illusory nature of perfection should be undone through settling for such an average appearance.